Read the instructions posted on this page to learn how to access the official Molly Maid job application (online version). Numerous current openings can be applied for by creating an online account and going through the application process. The instructions posted below detail how to create an account, search for current openings, and fill out/submit an application. About the Company: Molly Maid is an Canadian home cleaning franchise. The company was founded in 1979 and is currently privately owned. More than 400 franchises exist throughout the world. Step 1 – The first step of the online job search process is to go to the careers page. 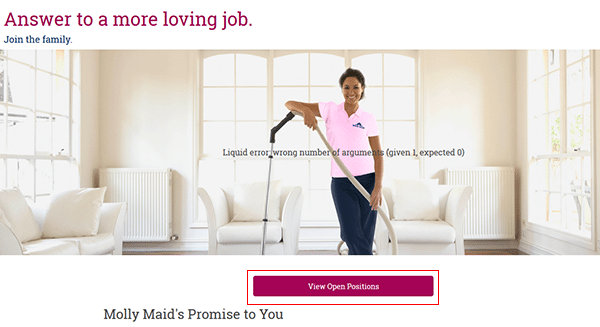 Click this link to have the Molly Maid jobs page load in a new tab/window. 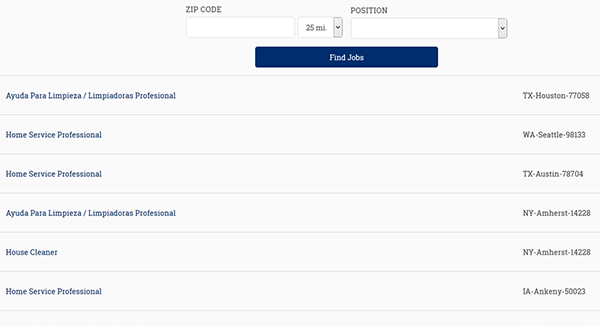 Step 2 – Press the “View Open Positions” button to go to the list of current job openings. Step 3 – Enter a zip code into the input field and then select a position from the drop-down list. Press the “Find Jobs” button to load the list of job opportunities in your search area. Step 4 – Click the link/title of the job that you’re interested in submitting an application for.